Muskie fish were stocked in Lake Mille Lacs by the Minnesota Department of Fisheries in the 1970s and it has become a true success story. Today, muskies abound and their size is astounding. 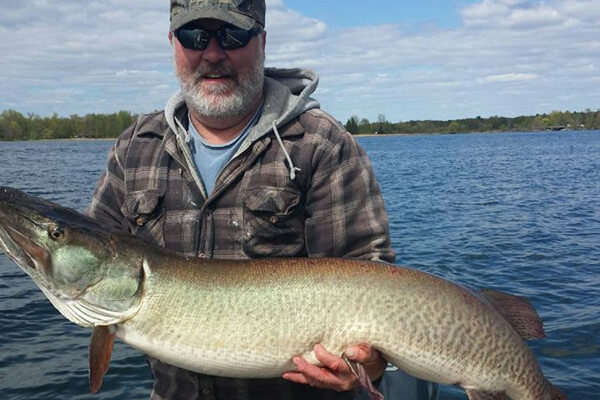 Many anglers believe the next state record muskie will be caught here. Even though it’s not a natural muskie lake, they seem to like the expanse of Lake Mille Lacs’ 132,500 acres. It provides the right habitat and room to grow record muskies. One recent catch, a 57-inch muskie weighing more than 50 pounds, was caught on a fly rod. Imagine that! The same month, a 55-inch muskie with a 30-inch girth, estimated at 60 pounds, was caught. “The Queen of Mille Lacs” or “Queen,” as we call it, was released rather than kept to certify her record muskie size. Queen is still out there for the next lucky fisherman to enjoy the catch of a lifetime. From June until mid-fall, until the weeds turn brown and begin to die off, there will always be muskie fish cruising the cabbage beds on Lake Mille Lacs. Since most of the lake is a deep-water basin, the cabbage weedbeds are found mainly back in bays and along a few shoreline areas. Lake Mille Lacs has many rock reefs as well and muskies like them on cloudy, windy days. Read up on the local fishing regulations, grab your muskie fish rig, and hit up the big lake in the heart of the state. No boat or no idea where to go? Lake Mille Lacs has fishing guides that specialize in muskie and know the hot spots all around the lake. And since the guides often write up the Lake Mille Lacs fishing report, you know you’ll be getting the latest fishing information when you book a guide. Lake Mille Lacs has great bait shops to help you get rigged with everything you need for the day or even the weekend. And the friendly, fishing-savvy staff is always happy to toss in a hot tip or two along with your lures. Fuel up. Rest up.Fish some more. Has all that fishing made you hungry for fish? Or are you craving a thick, juicy steak, a wood-fired pizza, or mouth-watering buffet? Lake Mille Lacs has a variety of dining choices. Do you want to book a lakeside resort cabin, a hotel room, or a campground? Choose your favorite lodging option and rest up. Then back to the lake you go!